Claimed innocence of the kidnapping of Charles Lindbergh, Jr., son of the famous aviator. Hauptmann was caught after passing a gold certificate known to have been in the ransom money. 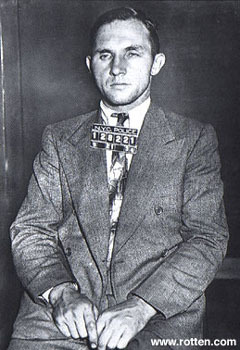 He was convicted based on circumstantial evidence: the finding of $11,000 of the ransom in his house; that he had the phone number of John F. Condon, the man who delivered the ransom; and that the ladder used in the crime contained a repair made from materials found in Hauptmann's house. Hautpmann explained the money belonged to Isidor Fisch, who died in Germany in 1934. The phone number -- perhaps the most damning piece of evidence -- was apparently scrawled by a journalist on a closet wall after the arrest of Hauptmann.